K-ON! 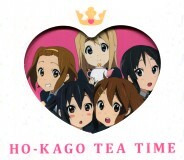 Gekichuuka Album "Ho-kago Tea Time"
This is a two CD set containing insert songs for the TV anime K-On (けいおん!). 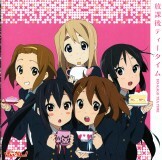 This package contains the studio and live versions of the K-On songs. Songs by the Sakura Kou Keionbu (桜高軽音部) [Hirasawa Yui, Akiyama Mio, Tainaka Ritsu, Kotobuki Tsumugi, Nakano Azusa], voice by Toyosaki Aki (豊崎愛生), Hikasa Youko (日笠陽子), Satou Satomi (佐藤聡美), Kotobuki Minako (寿美菜子), Taketatsu Ayana (竹達彩奈). The first pressing comes in a kira kira box. 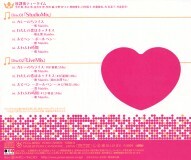 This album placed highly in the Oricon Daily Album Rankings. It debuted at number 1 on 2009.07.21, and stayed number 1 until 2009.07.25.